If you are the owner of a classic car, you understand the importance of taking great care of your investment. Classic cars are often only driven occasionally, and are not used every day like your typical family vehicle. This is why many opt to store their classic car off site. California automobile storage for classic cars is often considered as a nearby location instead of parking it in the driveway. There are many reasons why this is considered by classic car owners. Storing a classic car outside is never a good idea if you want to protect the interior and exterior of the vehicle. When cars are left out in the elements, wind, sun, and hail can damage the vehicle. The cost of repairing this damage can be high, and can lower the value of your investment considerably. A simple tarp over a classic car will not always protect it from the weather. Leaving a classic car parked in the driveway can invite intruders. Thieves that are looking for car parts, or may want to steal your vehicle, will be more interested when an individual leaves their vehicle outside for all to see. Storing your vehicle in your garage may not be an option, especially if you don't have the room readily available. Having indoor storage for your automobile is one way to ensure the protection and longevity of your car, as well as protecting the value of your classic automobile. 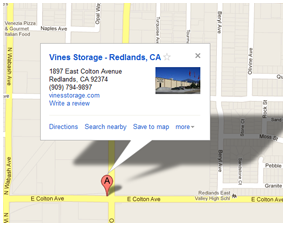 Vines Storage is a self-storage facility in the Redlands area that offers automobile storage options for car owners. With indoor storage, classic car owners can be rest assured that their investment is protected and monitored with our 24/7 video camera surveillance and on-site staff. Our convenient access hours allow you the ability to come get your ride when you're ready for the open road, but protect it when not in use. Vines Storage has a variety of leasing options to fit your lifestyle, and your budget. Our month-to-month leasing gives you the opportunity to store seasonally or yearlong, and gives you the flexibility you need to make changes in your leasing agreement. We are able to work with you to find the best storage option for your needs! Feel free to call Vines Storage today to learn more about what we offer at our large, convenient storage facility.